I see a lot of queries which keep coming up from people directly flying to Leh – Ladakh and have about 7 – 8 days in hand to explore various places in Ladakh. Looking at the requests of some many avid readers of the blog and so many like-minded travelers seeking guidance for their tour to Leh – Ladakh by Air, I would like to sketch below one of the most common itinerary for traveling to Leh Ladakh by air. Download your FREE high-resolution version pdf copy of this Leh Ladakh by Air day by day trip plan infographic guide. If, you liked it and found it helpful, please feel free to share it with your family and friends to help them too. Interested in saving a day? Flying directly to a high altitude place like Leh (3500+ Mtr) can cause serious issues sometimes if proper care is not taken to combat Acute Mountain Sickness. Hence, one must always be aware of the importance of Acclimatization and tips to help acclimatize to some extent before venturing to further high altitude within Ladakh. When you fly to such high altitude place like Leh you must give your body a chance to acclimatize a bit before actually getting started with the trip. That is the precise reason why road journey to Ladakh is more fun because it allows your body to gradually increase the altitude and hence, acclimatize to the raising altitude day by day, especially the Srinagar – Leh Highway. But, let’s look at how one can combat most of the AMS issues with very basic tips and can enjoy his/her Leh – Ladakh journey for about 8 – 9 days. Driving or flying to Leh Ladakh? This itinerary of flying to Leh Ladakh covers all three major tourist destinations of Ladakh including Nubra Valley, Pangong Tso Lake, and Tso Moriri Lake. Checkin at Hotel. Many hotels provide free pick and drop from Airport. Ask while you book them. Take ample of rest as well as water or anything that keep your body hydrated enough. DO NOT OVER HYDRATE. Take ORS Soluted water or ORS – L tetra packs from home. After 5-6 Hrs of rest you can visit Leh Palace, Local Leh market, Shankar Gompa. Follow the sunset by stroll at Changspa road and have a nice dinner on varied cuisines offered in-around Changspa road. Go back to hotel for overnight stay at Leh. Hire a taxi from Leh taxi stand or Hotel whichever suits you. Check the leh – ladakh taxi union rate list 2018 – 19 including the contacts of some reliable taxi drivers within Leh – Ladakh. You can get about 12-15% of discount by directly getting in touch with drivers and of course, talking in person rather on phone always help in bargaining more. You can call the local drivers directly to connect with them and check the more comprehensive List of Taxi Drivers for Ladakh – Srinagar – Leh – Manali with recommendations/reviews for DoW community members. Take his inputs if you feel reasonable and if required modify the plan accordingly but should suits you best. Ask him to be with you guys starting first day itself, if required and charged reasonable else do it at your own. Head for Nubra Valley and stay overnight at Hunder / Deskit. On the way enjoy a cup of soup at Highest Motorable Pass (as claimed) Khardung La. DO NOT stay more than 10-12 minutes. Deskit has monasteries with tallest lord Buddha statue and Hunder has sand dunes and bacterian camel safari. About 5-6 Hrs drive, depending upon the breaks you take in between and at Khardung La. Sumur has a famous monastery to check out and Panamik has hot water springs. About 7-9 Hrs drive, depending upon the breaks you take in between. Cover either of Hemis, Thicksey and Shey on the way towards Tso Moriri. Overnight at Korzok or Tso Moriri. About 7-8 Hrs drive, depending upon the breaks you take in between. 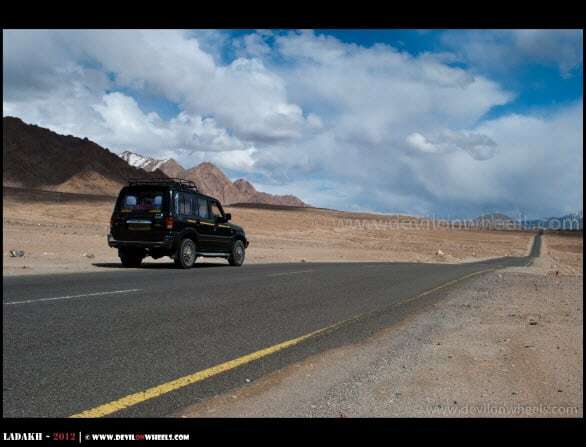 Come back via Tso Kar and Manali – Leh Highway to Leh. Cover either of Hemis, Thicksey and Shey on the way towards Leh. About 9-10 Hrs drive, depending upon the breaks you take in between. In the last couple of years (as of 2018), the direct route between Nubra Valley – Shyok Village – Pangong Tso has been stabilized a lot. It is not that desolate in the season anymore as it used to be a few years back. A lot of people do this route nowadays, so it should be fine for you to do that route as well. Just enquire at Agham village on the safer side or wait for a couple of cars to tag along on the route. Alternatively, you can also make a day trip to Pangong Tso (if Shyok village and Wari La pass routes are closed) as below but that makes it a bit rushy / hectic. You can add one more day or use the saved day to visit Turtuk village in Nubra Valley. I hope this plan or itinerary for Leh – Ladakh when traveling by Air will be useful to travelers planning their journey, at least for the first time. I will look forward to any queries or doubts or valuable suggestions and inputs you have and would love to discuss your custom plan as well in the comments section. If you know your friends or family are planning a trip to Ladakh by air, do share this article with them to help them make a memorable Ladakh trip. Hi Dheeraj, You are doing a great job by helping out everyone here thru your blog by giving valuable inputs about leh-Ladakh Trip. We are about 7 male adults planned to go Leh-ladakh trip by air, reaching Leh on 21st Sept and starting back from Leh on 28th Sept.
Can you please help us by providing the proper itinerary to make our trip as memorable one to cherish for years. Also can you please suggest if below Itinerary will works for us. Day 3: Leh > Nubra Valley – After reaching Nubra Valley Check in (Planning). Later sightseeing and camel safari. Day 4: Nubra Valley > Leh – Way back to Leh thru Khadung La and other sightseeing places. Day 7: Leh Local and nearby sightseeing places. Day 8: Start from Leh back to home. Mahesh, your plan looks nicely balanced and relaxed to me. You could have used Day 7 for visiting Turtuk in Nubra Valley. Best is to search the hotels after upon reaching at Leh. Thanks Dheeraj for quick reply. I have few more questions, hope you won’t mind in answering those questions as well 🙂 Thanks in advance. 1. Any suggestions/Recommendations for Hotels at each respective place ? All hotels will be same range of cost or will it vary? 2. Is better to opt package from local travels or go by self, which will be the best option. 3. What will be the estimation cost if we go with Package and also self trip. 4. What will be Max Temp and Min Temp from 21st to 30th Sept at Leh Ladakh. 5. Woolen Jacket will serve my purpose or do I need to take any better jacket. 1. You can check the nice, preferred list of accommodation options in entire Leh – Ladakh (Leh, Nubra Valley, Pangong Tso, Tso Moriri) including moderate (cheap budget hotels as well) in the series of articles starting on the link Cheap Budget Hotels or Accommodation in Leh – Ladakh. 2. Best is to reach there and book yourself. 3. You can save about 3-5K per person in general for moderate budget trip. 4. Max should be around 18-20 and min can go to 2-5. 5. Carry layers of clothing, do carry thermal inner wear just in case it gets overcast and cold. Snowfall might happen too as it gets usually cold especially monring and evening. Thanks Dheeraj for answering all my questions. Could you please check my below itinerary as well and it’s feasible to travel these places between sept 22 and sept 28. Mahesh, I will recommend that you stay in Leh the first two nights but as you are trying to cram Tso Moriri, the plan is doable but hectic for sure. And as an FYI, Turtuk and Hunder are part of Nubra Valley only. Any modifications /suggestions you would like to add. 2 adults n 2 kids; Any extra warm clothing required? What would be the average cost, in your opinion, by Innova / Xylo for the above trip. thx in advance. We are planing to visit Ladakh in Mid September. We are 5 people traveling to Leh via Flight. We can skip Kargil if there is any better option available. And It would be great help if you suggest some good Drivers and Hotels. Arpit, your plan is good. You could have visited Hanle instead of Kargil which is much better place and broken your journey betwen Pangong Tso and Tso Moriri. You can make a tour of Sham Valley on Day 2, skipping Kargil, and then from Pangong Tso via Chusul go to Hanle and stay overnight. Then from Hanle to Tso Moriri. Thanks for all the information on this portal. We (6 male adults) are travelling by flight to leh and have 5night/6days in hand. We will be hiring a local vehicle. Here’s our plan, please let us know, if it looks good or will be hectic. Day2: Leh to Nubra via Khardungla. Stay at nubra. Day 3: Nubra to Pangong via shyok. Stay at Pangong. I will highly recommend to add one more day rest in Leh before starting the long journey in internal parts of Changthang. Rest if you still want to follow it then Day 4 you should travel from Chusul route to Tso Moriri from Pangong Tso while on Day 5 you should travel to Leh from Tso Moriri via Chumathang. I am planning to follow this schedule in mid oct. everything looks fine and suitable… its just i am worried about the costing.. i know and have read your article on costing but still there is a bit of confusion as i am completely solo on this trip. so will be highly obliged if you can flash a little light on this. You are alone and private taxis are very costly in Leh but you will be able to find the shared taxi without much fuss at all. There are lots of flyers which people put at cafes, dine-ins, restaurants, travel agent desks/shops/whiteboards wanting to share the taxis for different trips within Ladakh. Even travel agent organize such shared taxis trip as well but charge a little higher about Rs 200-300 more than it would ideally cost. So, in the worst case, you can always go back to them and book a seat for yourself. Gelling up with people in Ladakh is more or less easy because many people travel solo and look forward to meeting new people to share costs. The people will be less in October though but still manageable now a days due to the extended season. You should consider about 1800 per seat for Nubra and Pangong Tso trip, 2300-2500 for Tso Moriri trip. Local sightseeing you can rent bike as well for about 1100 per day. Apart from it, it will be your tickets and food + stay expense that would be around a 800-1000 per day. Thanks a ton for clearing it. Here are my observations i would like to double check as i dont want to mess up my trip later.. i hope you dont mind clearing it one more time. Day 2- Rent a bike and roam around; that should cost me around 1500 in total for local sightseeing. Day 3 – 4 (the nubra valley trip) 2000 bucks. By this time i should be back to leh, right? Day 5-6(hemis, pangong, thicksey, shey) 2000 . Day 7-8 (hemis, Tso moriri, tso kar, etc) 2500. In total- 8000+ 8000 = 16000. We are planning a Delhi-Leh ladakh trip in April first week – May. Would it be possible to follow your ‘leh-Ladakh most common itinerary by air’ during this timeline? Or what timeline would you rather suggest if we want to stay at all the beautiful places like Pangong Tso and Nubra valley? You should be OK to follow the above itinerary in the months of June to September. However, in other months or shoulder season, Pangong Tso and Tso Moriri lakes are still very cold for night stay and hence it should be avoided. If you want to go in April end, I will recommend following the itinerary similar way but tweak it to sleep at guest houses in Tangtse village about 34 KMs before Pangong Tso and for Tso Moriri stay at Chumathang or Nyoma in basic stays. a. Can we do a Sham Valley tour on Day 2 on the suggestive itinerary ? Our travel dates are Oct 3- 10 and we are flying in to Leh. Thank you Ashish, glad it is helpful. 1. If you are feeling well and be in your limits, do not exert much, you can try Sham Valley on Day 2. Just don’t exert much. 2. Nubra to Pangong Tso is open now, so taxi driver will be able to take you on that route. It is always recommended to wait for few more vehicles at Agham village and travel in a group on th desolated route. Rest looks fine. Also, please bear in mind that both Pangong Tso and Tso Moriri will have cold and windy nights, go with proper clothing. Thanks a lot Dheeraj for your reply. Really appreciated. Would you also have an idea on the taxi costs for this itinerary. I went through your article on taxi rates list and suggestive drivers (again a very helpful one, thank you!). But since Oct is not a peak tourist season, so I expect a good bargain. I contacted a few drivers and best quote I got was for 30K for an Innova/Xylo for the above itinerary. Do you think it is a reasonable quote for this part of the season? Please let me know. It seems reasonable to me Ashish. In general, there is no off season in Ladakh till the time roads are open. After early breakfast, leave for Nubra Valley, driving across Khardong – la (alt: 18,380 ft. – highest motorable pass in the world). After descending in the valley, drive on to Hunder and check into fixed camp. Post lunch, you can enjoy the ride of double hump Camel on Hunder sand dune. DAY 5: Leh – Pangong Lake. After Breakfast Leave to Pangong Lake through Changla pass 5486 Mtrs. While ascending Changla pass 5486 Mtrs. Enjoy the beautiful panoramic view of the villages below the pass. After crossing the pass halt for picnic lunch at Tsoltak, the summer pastureland of the yaks. Arrive Durbuk and from there a short drive takes you to the western shore of the lake. Enjoy the landscape in the back drop of the Lake. This famous blue brackish Lake of Pangong is 5/6 Kms wide and over 144 Kms long with half of its running the other side of the “INDO CHINA BORDER”. One rarely feels so close to nature and environment and the scenery is unforgettable. Leave Pangong Lake after breakfast and retrace the road to Leh across the Changla Pass. Upon reaching Karu, drive across the Indus and visit Hemis Monastery, the biggest and most famous monastery of Ladakh, and then return to the highway for onward journey to Leh, en-route visiting Thiksey Monastery. DAY 7: Leh – Delhi. Your plan looks OK Sneha. You should carry oxygen cylinder from Leh for the entire trip. Please refer: How to Rent Oxygen Cylinders in Leh Ladakh? Kindly suggest if i should go to kargil on bike or should rest in leh. or if any change is required?? Thanks in advance. Planned as below, please suggest for better itinerary. Thanks a ton. .dheeraj. .
dada our itinerary is day 1 leh by air in the morning, full day rest. day 2 mo ve towards nubra and stay. day3 pangong and stay day 4 moriri and stay day 5 back to leh. day 6 leh sight seeing. day 7 towards kargil stay at lamayuru. day 8 srinagar. day 9 fly back. is this ok? we have package tour for 6 persons from leh to srinagar. any alteration or suggestion will be appreciated . You must rest at least two days in Leh after flying to Leh. 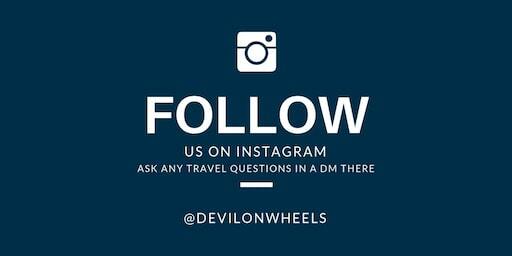 Awesome, that is wonderful to know you had wonderful time and Devil On Wheels website helped you. I have already asked a lot of questions , i just have 10 days left for my trip. I would like to modify the above itinerary liitle bit. 1. 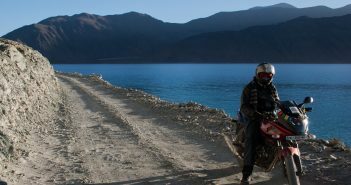 Instead of coming back to Leh from Hunder, How about heading directly to Pangong tso ? 2. Instead of heading back to Leh from pangong Tso why noy head directly to tso moriri? I read the respective articles but I want to know the conditions of those roads in 2017, May be you can help. Thanks. 1. The shorter road from Hunder to Pangong Tso via Shyok river was closed due to massive landslide, no idea when it may open. The longer route via Wari La has a couple of troublesome spots. 2. You can head directly but the road conditions are bad and the route is longer and hectic. If you have time why not go from normal routes. Thanks very much for the feedback. Guess I will take the normal route then. Yes riding jackets and knee pads and things like that. I was thinking if buying new would be better than renting it for 10 days. Can you show some light on the rental charges of the safety gears ? No shols where I could buy them ? I am planning a visit to Leh – Ladakh for 6-7 days in mid Aug 17 with my family including my 5 yr old son. Day 1 – Land in Leh, acclimatize, if comfortable market visit. Day 2 – Local sightseeing around Leh, visit monasteries , rest. Day 7 – Return back home. Is this comfortable with a 5 yr old boy. Further, can we do some addition if possible. Suggest some good drivers to hire the taxi to cater for the requirement. Your plan seems fine to me. Just make sure you keep yourself hydrated for initial days properly. You can call the local drivers directly to connect with them and check the more comprehensive List of Taxi Drivers for Ladakh – Srinagar – Leh – Manali with recommendations/reviews for DoW community members. Sir according to your suggestion and plan I have completed our spiti tour without any Hassel. This time me with my husband and brother planning to go ladakh.we wil reach leh27th sep and return manali by road on 4 the October. Ladakh is my dream destination and I want to visit important place of leh.I also want to visit kargil.my husband has some health issu o so don’t want hetric schedule.I want budget tour.please suggest me thanks in advance. Just replied you on other thread in Q&A section. I can see your passion for this region and the sheer amount of effort you take to reply to each and every comment. Let me tell you people like you are very very hard to find! Day 1: Reach leh and rest! Now i know this is a very hectic itinerary, but i really want to go to Tso Moriri and do not want to miss on Nubra Valley either. Do you think this is doable? Or should i skip one of these and rather travel to near by places from Leh which include the magnetic hill etc. What if i stick to this itinerary then i that case do i miss something by not visiting the nearby places? Also if i have to chose between nubra and tso moriri which one will you suggest? You can also take direct route from Nubra Valley to Pangong Tso in case you have some company of vehicles to accompany on direct routes and reach Pangong Tso on Day 4, come to Leh on Day 5. > stay overnight at Hunder / Deskit. What would be the approx. cost of taxi, if i cover all…? I think I replied to your other comment Ravi. thank you so much for nice and inspiring itinerary. With my friend we plan to spend 14 days in Ladakh moving almost with rented bikes and to Leh we will be travelling by air. Please would you recommend what places we should extend your proposed itinerary posted above? What other places not covered by this itinerary we should add to see as many interesting places as possible. I assume you are a foreigner so many direct routes between PAngong Tso to Tso Moriri and Hanle will be out of reach for you as foreigners are not allowed to travel on these routes. 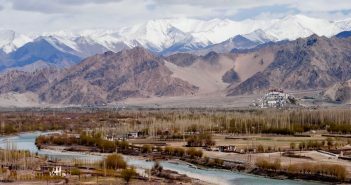 Hence, you can stick to the above plan and include Turtuk in Nubra Valley as a day trip or one night stay when you are visiting Nubra Valley. Very nice and quaint village. Then, if the time permits a two day trip to Dah Hanu villages as a bike ride will also be of fun where in you can include the Lamayuru as well. Let me know in case you need a detailed plan for 14 days but I will like to know that are you flying directly to Leh and flying our from Leh or doing road journey from Delhi – Manali or Srinagar? thank you so much for your quick response. Each of your tip will help us much. Yes, we are European tourists and will have direct flight to Leh to avoid complications with outside Leh rented bikes. Of course if you could prepare some biker plan for 14 days for foreigners flying directly to Leh I would very appreciate. I assumed with protected area permit I could visit similar places as Indian tourists but as you are writing obviously not. Many many thanks to you for help with itinerary and wish you nice day. — Enjoy the walks in local villages and cover sightseeing of Panamik and Sumur. We are 4 adults,3 females and 1 male and will be reaching leh by air. What do you suggest about renting a taxi? Should we hire a single taxi for our whole trip or should we hire one taxi at a time for individual place? And we are not much interested in sharing taxis. So do you think it would be safe considering we are only 4 in no. Plus there are 3 females and only one male? Our main concern in safety. You should hire the whole taxi for the trip at once because the driver will also charge you per destination basis only. For the leh – ladakh taxi union rate list 2017 – 18 including the contacts of some reliable taxi drivers within Leh – Ladakh, check the link here. You can get about 12-15% of discount by directly getting in touch with drivers and of course, talking in person rather on phone always help in bargaining more. You can call the local drivers directly to connect with them and check the more comprehensive List of Taxi Drivers for Ladakh – Srinagar – Leh – Manali with recommendations/reviews for DoW community members. I plan to travel in kashmir by bycicle. Could you pls tell me which is the beste season? Probably ist best to fly from europe via Delhi to Srinagar. As I red, it is best to start in Srinagar. Do I Need Camping staff for Srinagar-Leh-Manali? How is the political Situation in Srinagar and on the Highway to Leh? You are pretty much right. Best is to reach Srinagar and then carry on to Leh – Ladakh and come down Manali – Leh Highway. However, are you carrying your own bike with you? If not, best will be to land in Leh, take few days of rest and acclimatization and then ride the bike in Ladakh. Except one or two unlucky incidents, in the recent pasts things have been quite in tourist areas and tourists are allowed to travel freely on the tourist spots. Thanks for your replay. It is very Kind. Yes I will bring my own MTB and would like to start in Srinagar. I also bring my own camping-gear. Thinks is good to have it. Which would be the best month to start in Srinagar? Ok September will be good also for me. As I would like to spend more than 4 weeks, is it wise to come in August or stay still mid-october? Could you recommend me any hostal in srinagar, where People who cycle meet? I might travel on my own. Is this a Problem on the road between Srinagar and Leh? Red there are many solders near the road. Well, August is in general monsoon but towards the end of August it gets cleared up. I will last week of August is still OK.
July 1st:- Fly to Leh, take rest. Please answer couple of questions. 1) Is it enough to get permit for the following 3 circuits 2 days each? 2) Will it be fine traveling Turtuk and staying overnight there and traveling to Panggong from Turtuk? 3) Can we get accomodation at Turtuk/Hundar, Panggong and Korzok without prebooking? 1. YEs, permit wise you are fine in selecting the above places/routes. 2. I will not suggest Turtuk unless you plan to add one day in the Nubra Valley or use 8th in Nubra Valley. Else Turtuk to Pangong Tso and Leh to Turtuk will make it quite hectic and less enjoyable. 3. IF you are not particular about any place to stay, OK with basic accommodations as well, it is totally fine. Thanks Dheeraj, I’ll plan accordingly. First of all I would like to commend you on such an incredible job on this blog. I am sure it requires an enormous amount of time and effort on your part. Not a small feat. So a big thank you ! I am sure countless people such as myself have benefited from your travel adventures. My husband and I are planning to travel to Leh-ladakh mid July and plan to fly to Leh since we do not have too many vacation days. The itinerary we picked is almost what you suggested but we would like to reduce one more day if possible. Can you suggest which would be the best way to do that ? Can we somehow just do Leh to Diskit/Hunder and come back to Leh in just one day and skip Sumur/Panamik or would that be too much ? Not sure how else to reduce a day without missing out on any of the must visits. Another question we had was regarding the taxi driver ? We plan on trying to book a driver for the whole time if possible. Do they do that ? Also, what about the accommodations for the driver when we have the overnight stay ? Is that included in the rates you mention in another post or is it separate ? I will recommend that you take the direct route from Nubra Valley to Pangong Tso via Agham / Shyok or Wari La pass. Yes, you should skip Sumur, Panamik in lieu of it as there is not much to see as well at those places. Just make sure that you have some company at Agham village to travel to these desolated routes. Shyok route is shorter but bad road conditions, Wari La is longer, desolate but a bit better road conditions in comparison to Shyok route. Take a call then and there after talking to locals. This will give you the required one day to chop off. YEs Supriya, I feel this for both the points. I somehow feel more connected to Nubra Valley than the lakes as it offers many landscapes, so also prefer always spending one night in Nubra. And yes it also helps in acclimatization too plus keep your body less fatigued. I am planning a trip with just my wife in first week of july. I am planning to reach leh by flight and then hire a bike to visit the various places like nubra , pangong, thicksey, and other places around . I want to know how severe can AMS be and what can be done bt it.also are there any cool treks that i can go to of a couple of day or so….thank yu…. you will be able to find the shared taxi without much fuss at all. There are lots of flyers which people put at cafes, dine-ins, restaurants, travel agent desks/shops/whiteboards wanting to share the taxis for different trips within Ladakh. Even travel agent organize such shared taxis trip as well but charge a little higher about Rs 200-300 more than it would ideally cost. So, in worst case you can always go back to them and book a seat for yourself. yes the altitude for sure does matter. AMS is bound to set in however, there are a couple of things that must be done. 1. You should take plenty of rest on Day 1 and drink plenty of fluids like Glucon-D, ORS Solutions, Lemon Tea, Black Tea, Juices, etc.. that keeps you well hydrated always. Eat food at its time even if your body does not feel like hungry but if it is time to eat you should eat. Even drinking dal should be good enough if you dont want chapatis at that moment. 2. Do not exert too much nor sleep in the day. Try to rest with a couple of short slow walks only on Day 1. Keep a light jacket and shoes always on and in case it is overcast and cold, try to stay warm. That is it. However, if you take care of above two points, you should mostly be good. Thanks for mentioning very detailed plan. I am planning to visit leh ladkh from 22nd July to 30th July. We are 2 couples and have planned half trip on bike and half through cab. Can you look into my itinerary and suggest your input to make it memorable trip for mine and my friend’s family. 23rd July : Excursion to Sham Valley towards Kargil Visit Hall of Fame, Gurudwara Pathar Sahib, Drive to Magnetic hill, See picturesque landscapes at Nimmu village. Visit Likir Monastery. Also, I am yet to done booking for Leh, Nubra, Pangong and Hanle. Umesh, your plan looks good to me. Can you suggest some places to stay in leh, Nubra, Pangong and Hanle.. I m looking for stay in the range of 2000-4000 per night. Also, will i get rented bike in leh or i need to book in advance. Also for cab I have got the list of driver’s number from this website only. Should I book the same in advance or I can book after reaching leh. Now Ladakh’s charm is tugging at me again, and I’m planning another trip with friends. This time I’m doing it by air. This is my planned itinerary during the last week of August. Fri 25th Aug – Land early morning in Leh by flight. Rest for acclimatization. Sun 27th Aug – Leh to Nubra Valley (Diskit, Hunder, Sumur, Panamik). Overnight at Hunder. Tue 29th Aug Pangong Tso to Hanle (Spangmik-Man-Merak-Chushul-Hanle). Overnight at Hanle. Thu 31st Aug Board flight from Leh. I have 1-2 days extra to spare till 2nd Sept, if required. 1) Where can I slot the extra days? Nubra or Pangong? 2) Or is a trip to Turtuk worthwhile? Please let me know about the above itinerary. Do suggest changes if required. Good to re-connect and glad to hear that you had a wonderful trip !! Well, you have missed Tso Moriri in the plan. You can do Hanle to Tso Moriri and Tso Moriri to Leh. One day will be used there and the other day can be used by either resting in Leh or adding the day for Turtuk or going back to Leh from Nubra Valley and doing Leh to Pangong Tso to ease out things a bit overall. I will advice to keep that day as buffer for rest in Leh before you take the flight. First of all, wonderful website. I need your feedback on a short air trip to Leh. I am thinking of June 1-4, 2017 flying into Leh from Delhi and back. I can possibly extend my time in Leh by another day or two to, say, June 6. I have read the blogs and realize it takes a day to acclimatize to the weather, etc., so I am not planning to pack in a lot of activities. Primarily local sightseeing, and maybe a visit to monasteries and lakes. Primary purpose of the trip is to clear the mind!! I will suggest to look into: How to make trip to Ladakh in 5 Days? Please see my below plan. Please advise if this is feasible. I arrive directly in Leh on Aug 9th and leave leh on 19th Morning. Please keep the rest day in last because that will allow you a buffer as well in case you get stuck at Tso Moriri for any unforeseen reason. Rest looks pretty good. Also, rest day at Pangong Tso can be used as one more day in Nubra Valley to visit Turtuk. Not sure if you have any plan to rest at the lake but two days at Pangong Tso will give you enough and you may not need the extra thrid day. Thanks and hats off for this wonderful blog , We have booked our flights from Delhi – Srinagar , srinagar to Leh , Leh to Delhi ( May 13 -22 ) . Now looking at conditions in J&K and highway status ( for May 16th – Srinagar – kargil – Leh ) we are rethinking of cancelling Srinagar . Please advise . What else option we have to reach Leh to Delhi ? is it via Manali only , then we end up 2-3 days in travelling .? Apart from flying directly to Leh, you do not have any other option. 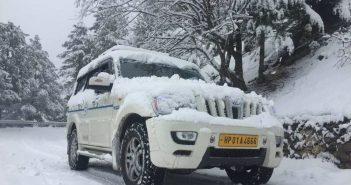 Manali – Leh is expected to open in last week of May but inclement weather is not helping much. After breakfast proceed to Kargil.Reach in afternoon and spend rest of the day relaxing. Night Stay at Kargil. After an early breakfast, proceed to Kargil. En route, visit Mulbek (known for its huge Buddha Statue) and Lamayuru monastery (The oldest monastery in Ladakh). Admire the confluence of Indus – Zanskar Rivers and the effects of Magnetic Hill (Defiance of the law of gravity). Visit Gurudwara Patthar Sahib & Kargil War memorial on the way to pay tribute to the Indian Army. It was in this very region in which the Indian Army fought and won the famous war of Kargil. Take some memorable snaps of Tololing, Tiger Hill and the war memorial in Drass. Reach Kargil in the evening. Overnight stay in Kargil. After an early check-out, proceed to Srinagar via Srinagar Leh Highway. Notice the gradual change in the colours of the mountains as you travel to Kargil. Cross the Zojila pass & Zero Point. Overnight stay in Srinagar. After breakfast checkout & proceed to Mumbai. This is our itenary and we are hiring 2 bikes and 1 scorpio from Srinagar throughout our journey. Just replied you on your posted question in Ask a Travel Question section. My friend and I have finally received our Indian visa and our flights have been booked for Ladakh in May! We can’t wait to experience this majestic place and we have made a plan according with some help from a few members at Tripadvisor. 12th May – Arrival at Delhi at 12 05 pm. 13th May – Arrival at Leh at 7 am. Full Day rest. 15th May – Sham Valley to Leh. 16th May – Leh to Turtuk which is at the extreme end of Nubra Valley, overnight in homestay (don’t prebook). 18th May – Early morning start from Deskit/Sumur towards Pangong via Shyok Village route. 19th May – Pangong Lake to Leh. Thiksey or Hemis Monastery en route. 20th May – Departure to home. We were looking for your feedback regarding this trip and whether this plan is feasible, given the distance and places we want to cover and how tiring it might be. Also, we had one last query, would it be better to visit Sham valley and be back in Leh in 1 day and then use the extra day to stay one more day in Turtuk? The plan looks balanced and it does not make you travel too much except Leh to Turtuk, which is OK. You can do that too, there isn’t much in Sham Valley and it can easily be covered in one day. Thank you for your quick response 🙂 As you are saying the Leh to Turtuk part is quite long journey, I guess we’ll stay one more day in Turtuk and visit Sham Valley in one day. One last help, should we try to book a Jeep for the entire plan or book the jeeps like, one for Sham Valley, One for Nubra? Yes, it will make more sense. You should book one taxi for entire trip. It does not matter. Thanks for your answer to my previous message. It might no be the best place for this post, but I was also wondering what would be the best way to arrange a 4 to 5 days trip from Leh in the Indus Valley mixing drive and trek. More precisely, we would like to visit the monasteries of the Indus Valley (including Likir and Lamayuru) in 2 days while spending half a day or a full day on the “baby trek”. Then we would head for a two days trek starting in Hinju via Khomze La and would return back in Leh by car. You can refer: How to make trip to Ladakh in 5 Days? My trip in Ladakh in July is mostly inspired by this article. Thanks for this wonderful job. Thank you 🙂 You are alone/couple and private taxis are very costly in Leh but you will be able to find the shared taxi without much fuss at all. There are lots of flyers which people put at cafes, dine-ins, restaurants, travel agent desks/shops/whiteboards wanting to share the taxis for different trips within Ladakh. Even travel agent organize such shared taxis trip as well but charge a little higher about Rs 200-300 more than it would ideally cost. So, in worst case you can always go back to them and book a seat for yourself. Gelling up with people in Ladakh is more or less easy because many people travel solo and look forward to meet new people and share cultural thoughts and values over the trip. Thanks Dheeraj. So I understand that you advice us to see directly on site rather than trying to sort this out from home with an agency. Is it correct? Would you have a travel agent to recommend to organize shared taxi? Yes, that’s correct. It will be much easier to bargain and there is no short of it. Regarding shared taxi, both main market and changspa road will be full of such hoardings or white boards looking for people for shared taxi. 23sep- Arrival at Leh airport after lunch visit, Shanti stupa,Leh palace, Leh market. (over night in leh). 24sep,-Leh to Kargil via Fotula pass, Namkila pass, Visit, Hall of fame museum, Guruduwara pather sahib, Magnatic hill, Sangam point indus & zanskar river confluence view, Lamayuru moon land view, Lamayuru monastery, Mulbek stone carving statue,(over night in Kargil). 25sep- Kargil to Drass back to leh visit, Drass 99war memoriel museum, Tiger hill, Tololing hill. (over night in Leh). 26sep- Leh to Nubra valley via Khardongla pass visit, Disket monastery, Hunder sand dunes double hump camel safari. (over night in Nubra hunder). 27sep – Nubra hunder to Pangong lake via Shayok valley visit, Spangmik village, 3Idots shooting point. (over night in Pangong lake). 28sep – Pangong lake to Leh via Changla pass visit, Hemis monastery, Ranchoo school. (over night in Leh). 29sep – Leh to Tsomoriri lake via Mahe bridge visit, Chumathang hot spiring water, Korzok monastery village. (over night in Tsomoriri lake). 30sep – Tsomoriri lake to Leh via Taglangla pass visit, Tsokar lake. (over night in Leh). Your plan looks quite good to me. Please make sure that you have some company to travel with you on Nubra to Pangong Tso direct route because it is a very desolated route. Hi Dheeraj , we are a group of 5-6 people and planning to flying into Leh and then hire a taxi. Do you think the following itinerary is possible ? Is there an option for self drive? I was planning to have self drive for couple days when i would be in Leh/sham valley and hiring a taxi when travelling to Nubhra/Pangong . We are planning a trip to Leh in the third week of April (not a road trip). I have read a couple of articles which suggest that it may not be the best time, as the roads may not open, but what are your views? We may not be able to push our holiday. so if it is really not a good time to go, we will have to cancel it. It is surely not the best time but a good time if you are OK with cold conditions and a bit struggle here and there on roads in case there is heavy snowfall during those days. Apart from that I have been to Ladakh in April, it was one of the best visits among all 7 🙂 … Roads within Ladakh remains open all round the year.= unless it snows on that very day or very heavy snowfall happens and then it closes for couple of days.